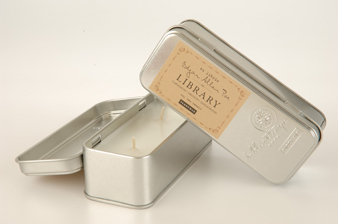 For all the bibliophiles in our lives, we present the Library Collection. Pairing favorite quotes with exquisite fragrances, we pay homage to the literary greats. impeccably packaged in commanding book cloth covered boxes adorned with foil stamped labels, this is the ideal gift for lovers of fine literature. Paddywax's signature Soy Wax, scented in Cardamom, Absinthe, & Sandalwood poured in a 3.5 oz travel tin. "All that we see or seem is but a dream within a dream."